I recently encounter this thing happen on my Windows 10 computer where a new drive letter named ESP suddenly appear on the list. I have no idea who created the drive as automatically listed on my PC devices and drives. To my curiosity I did try opening the drive but it needs security measures that even if the administrator account of your computer cannot open and explore the said drive. Looking at the properties of the drive, it has almost 500MB size with an automatically assigned drive letter which is letter ‘ESP (G:)’ on my case. I did search using Google and found some useful and knowledgeable answer that may resolve the issue of ESP drive appearance Window 10. Other says it’s a bug and some are pointing to UEFI partition allocated by Windows. 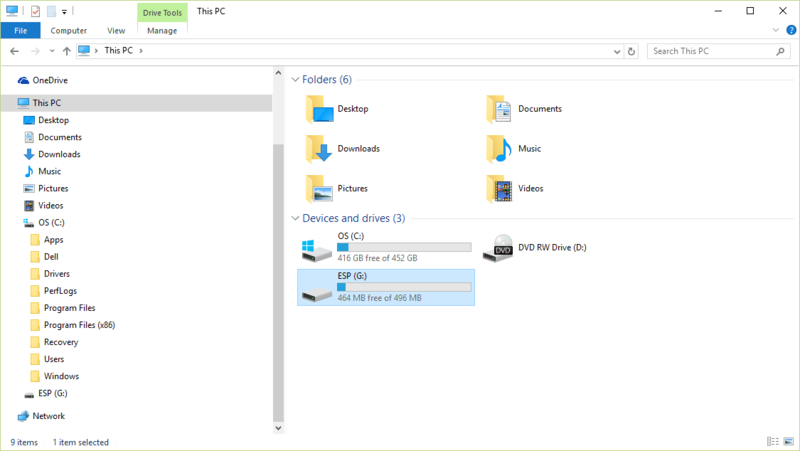 I’m not so sure on what to do with the drive, I am thinking on deleting the drive to remove it from the list but didn’t try that without knowing what will happen to my desktop if I remove the drive. I couldn’t recall that I created a drive, what I did so far on my PC since it was newly purchased is that I created an System Image Backup to my external WD drive and repair disc for Windows in case something wrong will happen. The first thing I did after reading uncertain answers over the web is I reboot my computer and logged back to Windows 10. After restart, I did checked the drives and voila the ESP drive is gone on the list of devices and drives. Yeah! After I restart the drive was gone.